Country house with pool in the picturesque land of Trapani. Cozy, spacious, comfortable and well furnished. Nestled in a wide fruit orchard created in the style of the Arabian garden. 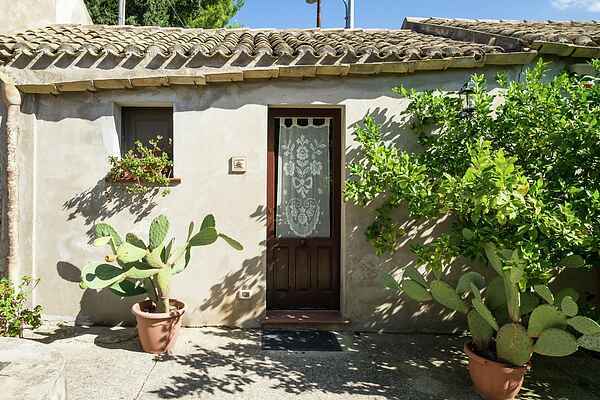 It is located in a small rural village on the hills from which dominates the surrounding wonderful landscape overlooking the castle of Ballada of Erice and Marsala countryside. This is a perfect location with panoramic outside space,privacy and peace. The swimming pool, available to guests, is only 200m from the house, you will be immersed in the green! The location is ideal for day trips to beautiful towns nearby . What do you think of the picturesque Erice ? The temples of Selinunte or Segesta ? The salt mines of Trapani? Once in Trapani, definitely make a day trip to the beautiful Favignana, an Egadic island. Slightly further, but just an hour away takes you to the bustling metropolis of Palermo or the Zingaro nature reserve. Do we need to say more? To Agrigento and Palermo (an hour away), the Zingaro Nature Reserve, Mouth of the River Belice, Islands of the Lagoon , Saline of Trapani, Monte Cofano, Egadi Islands.